The Philippine National Police seeks both prison and deportation for 23-year-old Jiale Zhang who threw a cup of taho at a cop. Mandaluyong Police photo. Foreigners will never be allowed to break Philippine laws and disrespect authorities, a spokesman for President Duterte has said. Salvador Panelo made this remark after a Chinese woman who threw a cup of taho (soya pudding) at a cop was charged before the Mandaluyong City Prosecutor’s Office today (Monday, February 11). 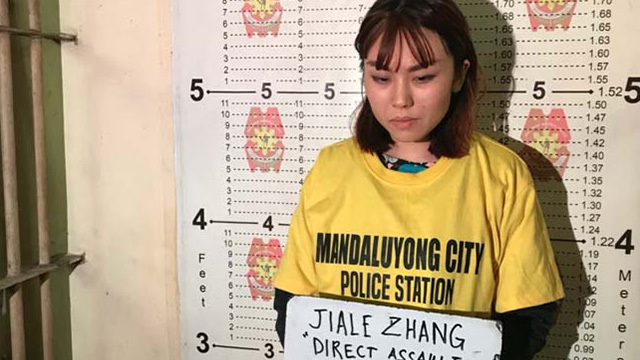 On Saturday, 23-year-old Jiale Zhang was caught on CCTV throwing a cup of taho at a police officer at a Metro Rail Transit station after he refused her entry due to a ban on bottled liquids in trains. In a fit of anger, Zhang then splashed the cup at him. “Foreign nationals who sojourn in this country should always behave otherwise they are subject to laws and deportation,” Panelo said in a palace briefing. However, he also agreed with Foreign Affairs Secretary Teodoro Locsin, who earlier tweeted that the incident should not be made a big deal. “I think I will follow the line of Secretary Teddy Boy Locsin on that matter. He issued a twitter on that. Secretary Locsin, he said that let us not blowup this issue,” Panelo said. The fashion design student is facing charges for direct assault, disobedience to an agent or person of authority and unjust vexation. Following the incident, Vice President Leni Robredo said Zhang insulted not only the officer but the Filipino nation as a whole. Robredo also the incident was a “wake-up call” to the supposed special treatment given to Chinese over Filipinos, including for local jobs. This, Robredo said, may have caused some of them to think they can show disrespect to Filipinos and break Philippine laws. The King of Inflaming is your boss, Rodrigo Duterte. And you do a lot of inflaming as well. Leni is right to point out your surrender to the Bullies of Beijing. Duterte’s words are often furious, profane, childish, insulting, racist, sexist, and/or threatening. Leni is reasonable and calm. Yet you say she’s the one inflaming. Hubris is the arrogance of those whose vanity leads to failure and destruction. The world sees this every day in the selfish, rude, boorish behavior of Chinese visitors. Just look at the furious expression on this idiot’s face. Send her packing.